People can now find out how well major telecoms providers serve their customers, using our new, interactive tool. 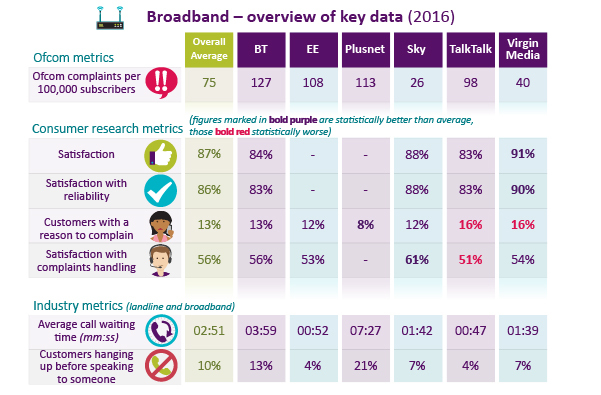 The online tool presents findings from Ofcom’s first ‘Comparing Service Quality’ report – published today – in a simple, visual format. The comprehensive report, and accompanying checker, allow phone and broadband customers to compare how different providers rate for answering customer calls, handling complaints, and reliability of their services. The data draws on a combination of consumer research and complaints figures, as well as statistics obtained directly from providers that have never been published before. The findings should incentivise providers to improve their service quality and fix recurring problems. Importantly, they will also help inform consumers who are shopping around for a new provider. Overall, 92% of mobile customers, 89% of landline telephone customers and 87% of broadband customers were satisfied with their service. 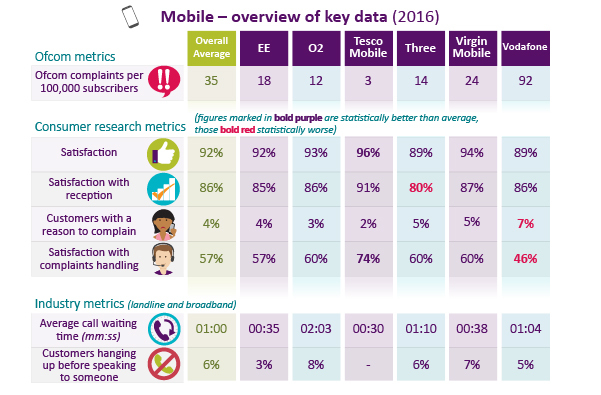 However, 13% of broadband customers had a reason to complain to their provider in 2016; this is higher than the proportion of landline telephone customers (5%) and mobile customers (4%). Of the broadband and mobile customers who complained to their provider in the last six months of 2016, just over half were satisfied with how their complaints were handled (56% and 57% respectively). By comparison, 62% of landline telephone customers were satisfied with how their complaints were handled. When it comes to reliability and performance, almost nine in ten broadband customers (86%) were satisfied with the reliability of their service, and 83% were satisfied with their online speeds. Meanwhile, 86% of mobile customers were satisfied with their reception. The report also found how long it can take for providers to install new services and repair faults. It found providers take an average of 13 calendar days to get a new broadband service up and running; 16 days to set up a landline service, and 16 days to install a landline and broadband service together. Where there’s a network fault requiring an engineer, the time taken to send the engineer will affect how quickly the issue is fixed. Providers using Openreach - the part of BT responsible for repairs and installations - can pay for a faster repair service for network problems. 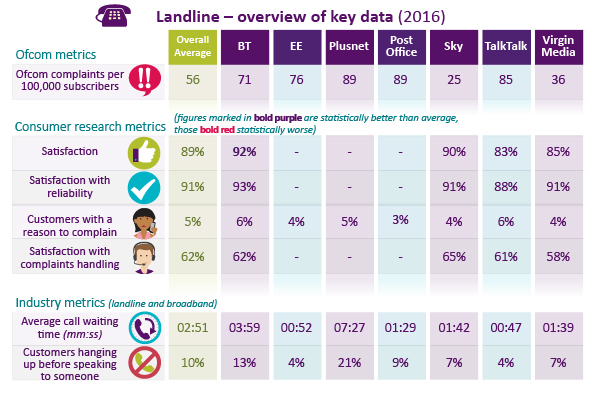 In 2016, most providers that rely on Openreach paid for repairs within two working days, the lowest service level. Ofcom has not been able to publish certain quality of service information, either because providers do not currently collect it, or they do so in a way that doesn’t allow like-for-like comparisons. In future, we expect to use new powers to require providers to collect more information in a way that allows performance to be directly compared. This might include areas such as fault rates and repair times. More findings from the report are available in the infographics below, and in the full report. Ofcom has today published the latest league tables on the complaints we've received about the UK’s major telecoms and pay-TV companies. Ofcom has today proposed that BT and KCOM should be the providers of the UK’s broadband universal service.